Here are two ballads from the late 1890s as performed nearly three decades later by Lewis James, a vocalist who was a prolific recording artist on Victor, Columbia, Edison and other labels from 1917 through the 1930s. In addition to solo vocals, James also recorded as a member of the Shannon Four harmony vocal quartette which later changed its name to The Revelers. 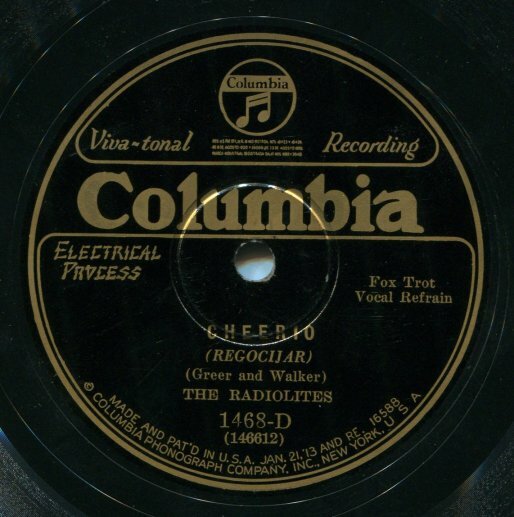 The success of The Revelers extended beyond records to include regular appearances on radio, in vaudeville and even a European tour. It was 78 rpm records of The Revelers that inspired the formation of the famous German vocal group, the Comedian Harmonists. I will dig out some Revelers recordings to include in future updates. 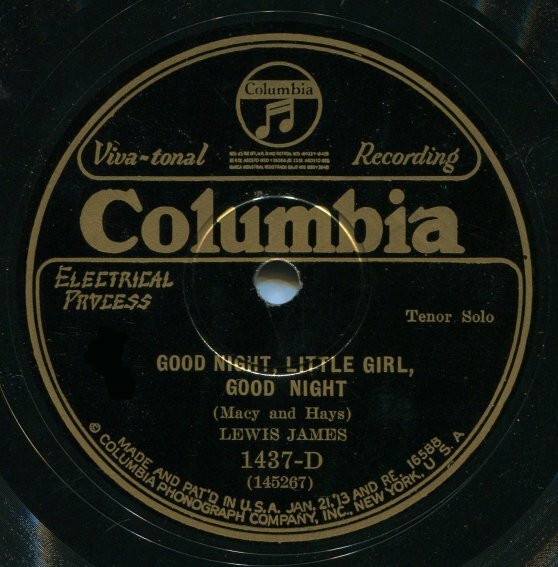 “Good Night Little Girl Good Night” was composed by James Cartwright Macy with words by Julia M Hays. It was published in 1898. “Absent” was published in 1899. It was composed by John W. Metcalf with lyrics by Catherine Young Glen. Here are a couple of recordings by jazz violinist Stuff Smith along with his sextette which was a regular fixture at New York’s Onyx Club. 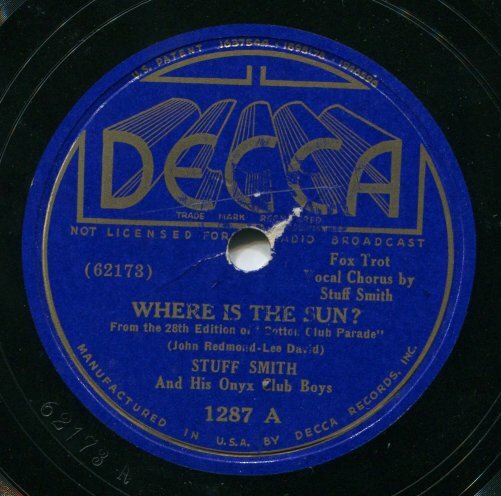 “Where Is The Sun” is from The Cotton Club Parade of 1937 where it was performed by Ethel Waters. The Cotton Club Parade was the name of the elaborate all-black cast musical revues that The Cotton Club staged each year. “Upstairs” is one of Stuff Smith’s own compositions. Here is a ragtime era novelty song that I think is fun. 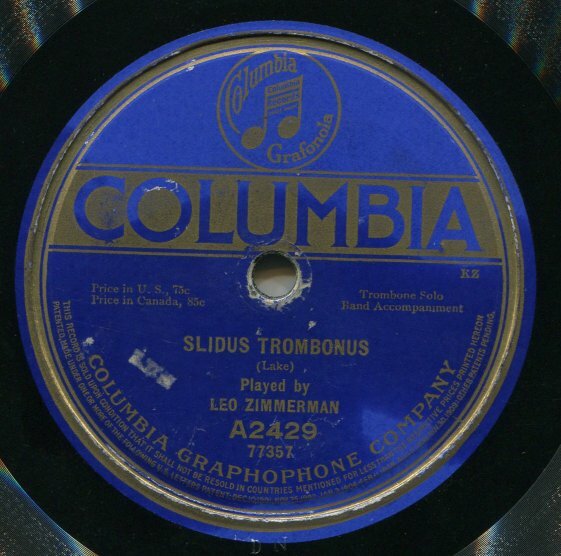 The original sheet music for “Slidus Trombonus” included a subtitle “A Trombone Comedy” which will make sense when you listen. The song was composed by Mayhew Lester Lake. Leo Zimmerman was, for many years, the first trombonist in John Philip Sousa’s band. 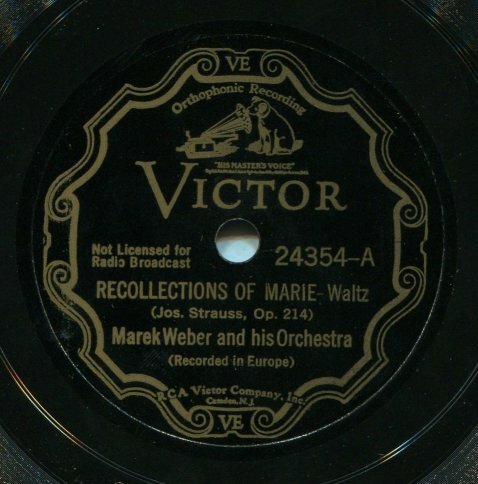 Here are a couple of waltzes performed by Marek Weber’s orchestra. The orchestra performed everything from the classics to popular music and jazz and achieved international fame through its recordings. For many years it was a regular feature at Berlin’s top notch Hotel Adlon. Weber was one of many Jewish performers who were banned from performing and had to flee Germany when the National Socialists came to power in 1933. “Recollections Of Marie” (“Marien-Klänge“) was composed in 1867 by Josef Strauss and was dedicated to Marie, Princess of Liechtenstein (1835-1905) who was the patron of the ball at which it was first performed. “Summer Evening” (“Soirée d’été”/”Ein Sommerabend”) was composed in 1883 by Emile Waldteufel. My copy is an American pressing on Victor. 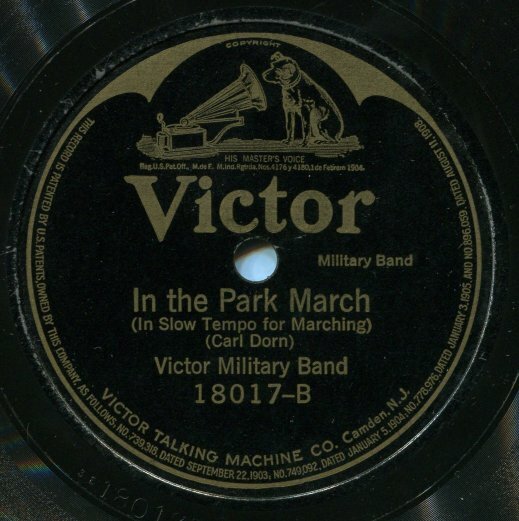 Both sides were recorded in Germany in 1930 but did not make their way into the Victor catalog until 1933. I have featured Marek Weber’s orchestra in previous postings: September 28, 2011, June 3, 2013 and, most recently on May 25, 2015. Say When opened at New York’s Morosco Theater on June 26, 1928. The production only ran for 15 performances and closed on July 7, 1928 just two days after these recordings were made. 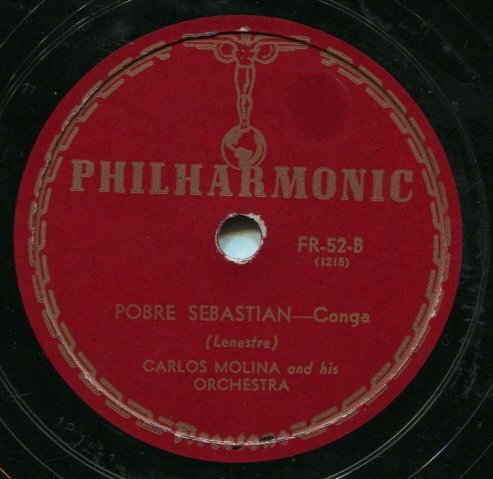 Here are some recordings by Puerto Rican born Carlos Molina (1899 – 1982) who led one of the more popular USA based Latin bands from the 1930s through the 1950s. 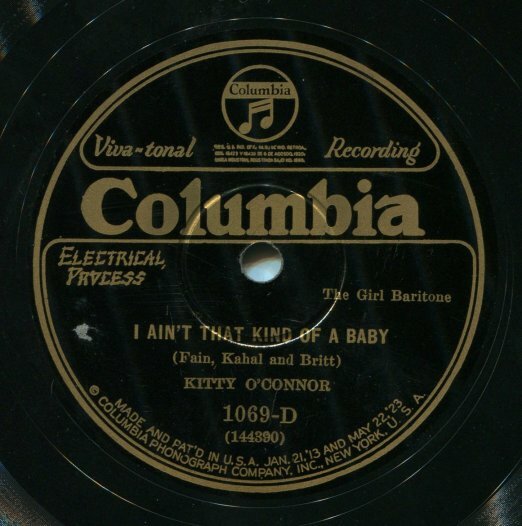 These selections were recorded by Eli Oberstein’s short-lived United States Record Corporation which was founded in 1939 and folded in 1940. All of these recordings appeared on multiple labels. For example, they appeared on Royale which was one of the USRC’s flagship labels. 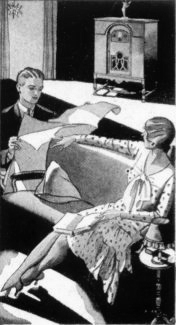 They also appeared on the Montgomery Ward label which was, for a period, pressed by USRC and sold though Ward’s retail stores and catalogs. They were also sold in Puerto Rico on the Fragoso label. My pressings are on the Philharmonic label which was distributed by the Firestone Tire & Rubber Company. While Firestone is known today for tires and its auto repair shops, for many decades the company had a network of independently owned Firestone Home & Auto Supply stores in small-towns across America which sold an array of Firestone private-label merchandise ranging from appliances to radios and phonographs to bicycles to sporting goods and, of course, auto supplies. For content, the Philharmonic label drew from both USRC material as well as from Columbia. If you look at the bottom rim of the label image above, you can make out the Firestone logo. I have not been able to locate any information as to who the vocalists on these recordings were. 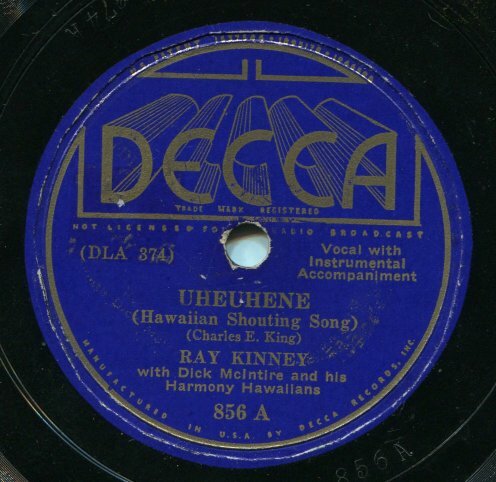 If you enjoy these selections, you might want to check out my June 8, 2013 posting in which I featured another nice Decca record by Kinney and McIntire. Here’s a record I from postwar Britain by a group that has a rather unique but pleasant style. I especially enjoy the “Dream Girl” side. Pianist and organist Jimmy Leach was a regular fixture on BBC broadcasts from the 1940s through the 1960s, including the long running Music While You Work program which I wrote about in my August 30, 2011 posting. Vocalist Alan Dean was consistently voted as Britain’s most popular male singer in Melody Maker newspaper popularity polls from 1949-1952. 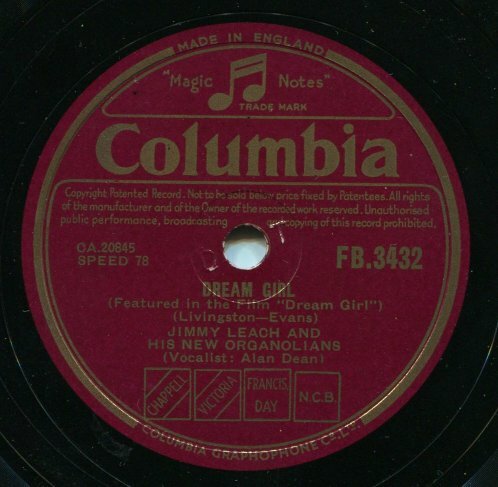 “Dream Girl” was the title song from the 1948 Paramount film Dream Girl which starred Betty Hutton. “The Chapel Over The Hill” was one of Jimmy Leach’s own compositions – on this he shared composer credit with Gerry Mason.